I am a big fan of Old Time Radio, and I think you should be to. My Dad was a little boy in the heyday of Radio, so he would share with us kids some old recordings of Edgar Bergen and Charlie McCarthy or Abbot & Costello. It wasn’t until a few years ago that I sort of ‘rediscovered’ old radio shows. On a late drive home, I stumbled on an AM station that was playing an episode of Richard Diamond Private Detective. I was hooked. 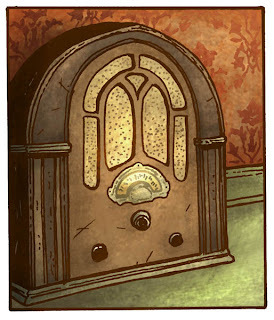 I found that Old Time Radio is the perfect thing to listen to when I’m working. Both XM and Sirius radio have a station dedicated to it and there are several sites to find episodes online for free. So every Saturday in Feb. I’ll be sharing one of my favorite shows. “Who knows what evil lurks in the hearts of men…The Shadow knows!” On September 26th 1937 Orson Wells became Lamont Cranston aka the Shadow for radio listeners of the time. The Shadow was already a popular character in the pulp magazine of his own name, but his radio persona became a new line of continuity for him. The radio show changed the character to have the power to “cloud men’s minds” both hypnotising them and making himself invisible to their eyes. This was, evidently, done to help speed along the show not spening narration time describing how the shadow was hiding or crouched or staying out of sight in general. The radio show also introduced the character Margo Lane as the Shadow’s love interest and crime solving companion. I love the Shadow. My dad bought a box set of it and we listened to the whole thing one Saturday evening. Thanks for the link. I gotta check that out. Hope you're having fun in NY. Hi, just wanted to suggest this show on Itunes called Wormwood. It's done like an old time radio show and it features a paranormal detective working in a town where supernatural mysteries are all over the place. I think you would really get a kick out of it. Thanks for all that you do and I'm super excited about the next issue, I hope Lieam rocks that owl like he did the snake.